The only bright spot about this place is a nice collection of signed sport jerseys. Jordan, Sabonis, Malone, Jagr etc. For the rest of it - just an average bar with average choice of average food. Nothing to recommend. The bar is exactly what you expect from a nice sports bar, many smallerscreens and one big projector screen which basically means that there are no bad seats with respect to watching games. The list of beer is perhaps not the longest in the world but you get nice local beers which are perfect as a compliment to the sports. 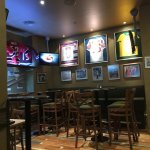 The food is ok for a sportsbar. We had a starter plate with sausages and deep fried stuff (which actually was really(!!!) deep fried) and hamburgers. If you weren't there for the sports the food would probably not be good enough to merit multiple revisists but the combo is certainly fine. The service was a bit shaky as the waitress got the orders mixed up (we think cheese burgers turned into chicken burger....), but everything was resolved. Stop here in this pub for a beer in my walk trip in this city. Nice place for a beer and lunch. Big place for a sport evening. 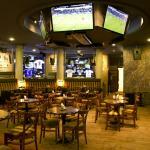 Fantastic sport place with great menu, service and atmosphere. Great place to watch sports! Nice decorations, and good sound system. Very nice and cozy place! Been to Stars and Legends? Share your experiences!